The rover is to be powered by nuclear generator (not shown in this drawing) permitting the Mars machinery a long range ability to explore science targets. PASADENA, California - Picking where to land the next wheeled robot on Mars is a formidable task--but plunking down a $1.5 billion rover on the planet safe, sound and ready for prime-time science is also a daunting job. 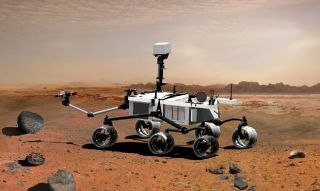 To be launched in 2009, NASA's six wheeled Mars Science Laboratory (MSL) is to gather specimens of martian soil and rock. It will then analyze those samples for organic compounds and gauge environmental conditions that could have supported microbial life on that planet, now or in the past. At the first MSL landing site workshop, held here May 31-June 2, Mars researchers and rover mission designers began a multi-year task of working together. The goal: to mesh stringent engineering constraints with the best locations on Mars to further scientific scrutiny of the red planet. The meeting became part Mars beauty pageant, part high-tech trust in space hardware. "If you don't land safely, you've got nothing," said Matt Golombek, co-chair of the landing site steering committee and a leading Mars scientist at the Jet Propulsion Laboratory (JPL) in Pasadena, California. "Basically, it's a mission critical event." Dozens of possible MSL landing zones were reviewed during the three-day gathering. "You want to learn everything you can about the site," Golombek said. "It's one thing to write a science paper that presents a viable working hypothesis...it's another thing to risk a billion dollar mission on that interpretation. I take this very seriously. I don't go to Las Vegas. I don't gamble." Culling through a lengthy inventory of prospective MSL touchdown zones, a first-cut priority list emerged. The Nili Fossae trough received high marks and was considered an excellent opportunity to investigate habitability on early Mars. Likewise, Holden crater received a large show of hands as it preserves a diverse assemblage of sedimentary deposits and was judged an accessible and scientifically compelling target. Then there's Terby Crater that hosts a diverse suite of geomorphic units and landforms including massive layered ridges and mantled ramps--also deemed ideal for MSL's sophisticated suite of instruments. Marwth Vallis percolated to a high ranking given recent detection by Europe's Mars Express of hydrated phyllosilicates in that area. Potentially, rocks containing phyllosilicates, it was pointed out, could themselves still host biorelics if ever life emerged at Mars. "Nothing is falling off the table at this point," said John Grant, co-chair of the MSL landing site steering committee and a geologist at the Center for Earth and Planetary Studies at the National Air and Space Museum in Washington, D.C. "Nobody should be sobbing wildly in tears if their site doesn't end up as one of the top five," he advised, noting that extra sites are likely to crop up in the near-term. Steve Ruff, faculty research associate in the Department of Geological Sciences at Arizona State University in Tempe said the site picking process is working as advertised. "We're seeing in these landing sites the hopes and desires of this community of where to go in its most basic, raw form," Ruff told SPACE.com. "It's encouraging to see how the new data sets have really refined our ability to select where we should go to satisfy MSL mission goals." What's ahead is making a list and checking it twice...maybe even more given the fleet of red planet orbiters, particularly the recent arrival of the super-powerful Mars Reconnaissance Orbiter (MRO). Promising MSL landing sites will receive extra-special attention, not only by using data accumulated by NASA's MRO, Mars Odyssey, and Mars Global Surveyor, but also the European Space Agency's Mars Express. Given all that sensor power, the touchdown point of MSL in 2010 will be the most studied locale on Mars in space exploration history. Nevertheless, getting MSL onto the planet in the first place requires a bit of engineering magic. Mars Science Laboratory will be the first planetary mission to use precision landing techniques, outfitted with onboard smarts to steer itself toward pre-selected landscape--akin to the way the space shuttle controls its entry through the Earth's upper atmosphere. MSL's guided entry makes the landing ellipse small--compared to the dimensions of real estate targeted by earlier landers--down to some 6 miles (10 kilometers) radius. That allows scientists to pick a lot of places to go...places that have not been available, said Richard Cook, MSL Project Manager at JPL, in a pre-landing site meeting interview. Following MSL's entry, things happen in rapid succession--such as deployment of a huge parachute, radar sensing of the rapidly approaching terrain, and the blazing away of retro rockets. Snapping his fingers quickly, landing events have to take place one right after the other with very little time in-between, reported Michael Watkins, Mission System Manager for the MSL project at JPL. "The less time between those, the riskier that system is. You'd like to have X-seconds of margin in each of those steps," he said. The lower the altitude of the chosen landing site, Watkins added, the more time the entire MSL landing system will have to decelerate and play out successfully. There is no air bag landing this trip. MSL is too massive. The rover will be tenderly deposited onto Mars via a tether reeled out from a Skycrane system, a rocket-powered contraption that hovers above the landing site. An animated view was shown of how MSL gets down on Mars in step by step, matter-of-fact fashion, prompting one cynical scientist to say: "And enter miracle here." A nuclear-powered MSL is built to live longer than those smaller, solar-energized robotic twins now trekking about Mars--Spirit and Opportunity. This week, in fact, the MSL project is undergoing a preliminary design review, a milestone making event toward getting to Mars. Once MSL is set down on Mars via the Skycrane, the rover will be near ready to roll. It will take a couple of days to ready itself for wheeling onward. Regarding rover range, JPL's Cook told SPACE.com, that engineers are working to a requirement of being able to drive some 12 miles (20 kilometers). MSL has both "land and look" and "go to" abilities to scout about. The science-equipped rover is to assess whether Mars ever was, or is still today, an environment able to support microbial life. On one hand, MSL's mission of roaming about is geared to determine the planet's "habitability"--but that duty is handicapped by planetary protection rules. Some Mars touchdown sites may not be as acceptable as others. A crash landing could lead to MSL's radioisotope power source polluting water ice in the region. "We have to be careful about putting Earth microbes in the places where they can grow and thrive," said John Rummel, Planetary Protection Officer at NASA Headquarters in Washington, D.C. MSL's nuclear power source will stay hot for a long time, he added, and coming in contact with martian water ice, a warm little pond might make a comfy home for microbes. Hitchhiking microbes from Earth on MSL becoming part of the martian water system is a no-no. Having MSL turn-tail away from water, put off some scientists at the workshop. In particular, not driving to a Mars gully or two--arguably, the product of groundwater seeping to the surface--is perplexing given that the rover's mission is to identify both Mars' past and potentially present habitability. "Recognizing that going to gullies may not be possible because of planetary protection means there's something wrong with our system," argued Ken Edgett, a staff scientist and gully expert at Malin Space Science Systems in San Diego, California. "How can NASA not have given us a mission that we can't go to the kind of places where we think liquid water may be present, or may have been present in relatively recent times?" Edgett said that he fully acknowledges the planetary protection concerns. However, he wanted the science team to understand what is going to be missed out with the MSL project. Why not have scientists tell the engineers where exactly on Mars they want to go ... and then have designers whip up the requisite hardware? A "here's where we want to go...now get us there" grumbling was registered several times during the landing site workshop. "We, the scientific community should be saying where on Mars do we want to go ... what science we want to do there ... and then go back to [NASA] Headquarters and say this is what we want to do. Can you afford this? But we don't do that," Edgett said. "Let's turn it around for the next decade in that direction." Indeed, the MSL mission comes fully-loaded with constraints. Altitude of the desired landing site, as well as high winds and up and down drafts must be accounted for. So too are big ugly rocks within the touchdown zone. And nasty, steep slopes can foul-up wheels down day. But getting MSL on the ground is a communal, death-defying act. It melds engineering know-how and a quest for new insights about the red planet's past and present. "There's always been a merging of the two," said veteran Gentry Lee, JPL's Chief Engineer of Solar System Exploration. "Anybody that thinks otherwise is wrong. It is give and take, back and forth." Lee told SPACE.com that MSL engineers have not built fences ... but have provided some guidelines. "There are those who are on one side of the fence or the other. But you have to put something down in the beginning" Lee said. "But the decisions are made by blending the two. That's the process. ".